I don’t care if a single soul isn’t going to see you, you still need to get ready for the day. You will feel better and more motivated. My usual routine is a minimal of brushing my teeth, washing my face, putting on a little makeup, and changing out of my pajamas. My rule of thumb is to be dressed enough so I won’t be embarrassed if I need to answer the door. I am actually more productive when I am comfortable (jeans aren’t my favorite), so my go-to “work” outfits typically revolve around my beloved yoga leggings and soft shirts/sweaters. The key for me tends to be in wearing more well-fitted clothing; I try to avoid wearing anything too baggy, as that has the potential to make me feel like a slob. However, if you think you’re going to get bogged down by starting anything around the house, create a rule for yourself that no housework is to be completed during your set working hours. I’m sure I don’t need to list all of the health benefits of drinking enough water for you. I have my trusty water bottle that is always by my side to help me keep on track with my water intake. The bigger, the better because it’s less time you spend filling it up throughout the day. Staying well-hydrated allows you to remain focused and your mind to be more crisp. Not getting enough fluids can leave you feeling foggy. Ain’t nobody got time for that! Unless you are working on something that requires your utmost focus, having a bit of music in the background can be a good way to get you pumped up and keep you in an upbeat mood. Depending on what I’m working on, the right music can even get me working more quickly. If you can swing it, they truly make a world of difference. I’m very sensitive to noises and can become easily distracted by even a dog barking outside, particularly if I’m writing. My hubby got me these headphones 4 years ago for my birthday, and it’s been the gift that keeps on giving! Good headphones help me keep my sanity and stay on track. No, a burger and fries isn’t going to cut it. It sounds like a duh suggestion, but it really does make a difference in preventing a post-lunch energy crash. Healthy food = fuel to power through your afternoons instead of being slumped over your keyboard barely keeping your eyes open. Whether it’s an hour to read, get some exercise, play with your kids, or just sit and enjoy your lunch….you need it! Take a break away from your computer, your eyes will thank you. In spring/summer/fall I enjoy going for leisurely walks around lunchtime to get my blood pumping and clear my mind a bit. The extra sunshine always does wonders for my spirit too! Whether it’s an office or a little desk stuck in the corner of your bedroom, it really does help to have a space that is dedicated for the sole purpose of getting work done. Transitioning from life to work can be a bit difficult when both are done under the same roof, so having some consistency in regards to where your work gets done can really help you get into the working mindset when you need to hunker down. Set a precedent that your scheduled work time is only for working. Whether it’s letting your kids know that you are unavailable to play during that time, or letting friends know that you aren’t free for impromptu chats, it will really help to set boundaries between your personal and work life. Otherwise you end up feeling frustrated by the lack of work you’re getting done and left with disappointed loved ones who aren’t sure when they can connect with you. Don’t make it a habit of working until midnight every night. As a night owl by nature, I find myself wanting to do this all the time. Unless you are truly on a roll and producing quality work into the wee hours of the night, call it quits and start again after you’ve had a chance to catch some shut-eye. 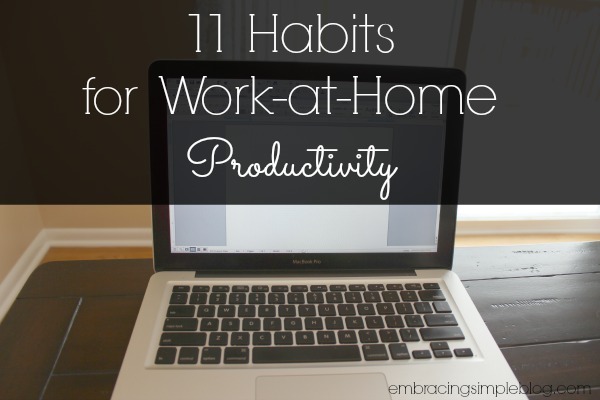 Do you have any habits that you find helpful to stay productive while working from home? Please share with us in the comments below, it’s always great to be able to trade tips for success! These are great tips! I’m still trying to find the balance between work and spending time just being mom. I’m going to try using these and see if they help. Some very sensible tips here – particularly about boundaries and avoiding social media and phone checking during work hours – something that also applies to office life too. Definitely Linzi! I think a lot of these are applicable whether you work at home or in an office environment. loved these tips! Running multiple companies from my home office, it’s so easy to get distracted with house work. I’m gonna try your one hour a day break idea and see if that helps me not get burnout. Thanks! These are great tips. Thanks for sharing! I hear individuals ask sometimes how people get work done at home when the couch, TV, refrigerator and other temptations are right there. While those temptations may present initial difficulties, I suspect the greatest long-term challenge may be avoiding workaholic mode because the tools for work are always there, too. Thank you Richard! You are so right, while those temptations are definitely there (the fridge being the main draw for me 😉 ), I find my greatest challenge is having a work-life balance that is truly balanced. I tend to be a workaholic when I love what I’m doing, so it can definitely be a struggle at times. As a self employed architectural lighting designer, I have learned these techniques to add to your list. Create deadlines for yourself by telling clients when they will receive your work. Make time to run errands and take yourself out to lunch and read your current book at least once a week. Add a yoga class to your schedule and consider that time booked. Hire an intern for filing and a bookkeeper for billing encouraging you to work more billable hours, learn to delegate. Drink herbal tea and water instead of coffee after noon. Have fruit as afternoon energy snack. Get away from your computer every half hour to stretch. I get involved in a project and forget this one too often. As obvious as a lot of these tips seem, it really helped to have them all laid out for me. Here’s to a productive week with your amazing guide, thank you so much! Thanks for these great tips. I have to especially remember to take a break. Sometimes it’s natural to just keep going but I know that creating balance will also bring better productivity. Yes Marva! Breaks are SO important in being able to stay productive! This is a great list of suggestions! I have been looking for good ways to improve my productivity at work. I am sure these will help. My problem is the discipline to keep going. I’m great at starting this.. but after a while I lose the focus to keep them going..
All great tips, thanks! Sometimes I like to set a timer for tasks. Once the timer goes off, I take a break. The timer keeps me on task and not as easily distracted. It’s a great way to see how often you can be distracted with a 20-30 min time frame! Absolutely Lauren! I love setting timers as well, it’s like my own personal challenge to see how quickly I can complete tasks too! Thanks Anna! And yes, SO hard. I struggle with that one too, but it truly does make such a difference! Thanks for reminding people about these ideas. I do most of them already and they help greatly. The other thing that is a huge help for me is to workout in the morning. It really boosts my energy and focus because I seem to just shift my focus from my body when lifting weights to my work tasks. I’m fortunate that I have a Bowflex in the basement so 3 days a week that’s how I start my day. To be consistently productive you have to be in reasonable physical condition or all the tips & tricks in the world won’t keep you going. Thanks Kristin! Scheduled breaks are a wonderful thing!! Indeed, developing profitable habits can help us so much to increase our productivity level while working online from home. You really show us some great habits, I already practice some of them for a while, however, there still are new ones that I will put in action soon. Thanks Omar, glad you found them to be helpful! So glad to hear it Fanny! Love it, I’ve started working from home again recently and find that I’m actually visiting my local library more often. With free wifi I can often find a desk that I can use to really focus on my work. I also find that taking the dog for a walk helps me to move from one task to the next. I like your tips. I think it’s very important to distinct private life from work, especially when you work from home. Dedicated workspace, having some sort of a morning routine, not staying the whole day in pajamas – it all matters. Another thing that increases productivity is using a task manager. My favorite one is https://kanbantool.com/ . I start every day by checking my Kanban board to figure out what I need to do. It saves me a lot of time.